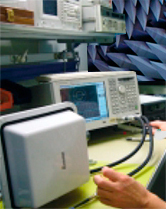 ADVANTEN is a private french company involved in the development and marketing of advanced equipment for wireless data and video communications. Our products are intended for civilian, industrial and military applications. As service provider, ADVANTEN can also offer support from the preliminary study to the deployment of the final solution. In particular, our R & D team has also a good knowledge of the radio propagation in different environments: Ground, air, sea, urban, forest, underground. This competence enables us to support customers, who wish to, for the choice of the most appropriate equipment for his application.